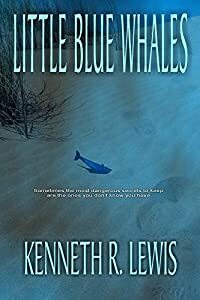 Little Blue Whales by Kenneth R. Lewis, a Mysterious Review. Review: Kenneth R. Lewis' debut novel, Little Blue Whales, is a cat-and-mouse-style thriller set on the Oregon coast that has a credible premise and some interesting characters but ultimately fails to adequately develop either. Kevin Kearnes is the newly hired chief of police for the seaside town of Cutter Point. An outsider from Kansas, he struggles to fit into an established organization that needs him but doesn't want him. And his leadership skills are tested early: a serial killer has been targeting pre-teenage boys up and down the Oregon coast. Not unexpectedly, the town leaders try to play this highly explosive situation to their political advantage, interferring in the investigation at every step. But Kearnes doesn't need the town counsel to second guess how he's managing the investigation; Kearnes has a personal connection to the case that causes him to question his ability to bring the killer to justice. The story in Little Blue Whales alternates between the perspectives of Kearnes and the killer, Uriah Beek. While each character has the potential to draw the reader in, neither does to any significant degree. Kearnes is the more complex of the two, conflicted in many (too many) ways, but his character is defined more by the conversations he has with others or the situations in which he finds himself. It's more two-dimensional than three. Beek is even less developed and is, somewhat ironically, largely forgettable. In many ways, Thud Compton, Kearne's second in command and candidate for the top job before Kearne was hired, is the most interesting character in the story. Fortunately, he's given a lot of face time, as it were. The overall plot is fairly typical of a serial killer thriller, but is so loosely constructed that it doesn't generate any real suspense. The pacing is erratic, there are too many extraneous scenes that contribute little, the relationship between Kearnes and his new lady friend is never believable, and the surprising revelations are anything but. Overall, Little Blue Whales is a disappointing effort in this increasingly crowded subgenre. Acknowledgment: Krill Press provided an ARC of Little Blue Whales for this review.